My phone takes awful, non-focused pictures so it almost seems pointless to post them….almost. I started by prepping the fresh thyme…and I’m glad I did because that took freaking forever. Have you every de-leafed fresh thyme?? Not sure it’s worth it…but anywhoo, I’m glad I did that before I got anything cooking. 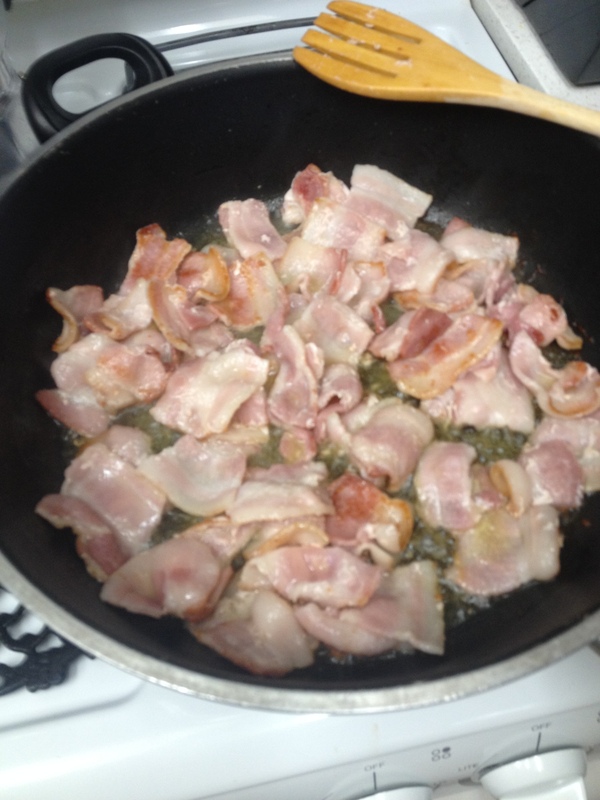 I then cut the bacon and placed that in a bowl, ready to go (side note: I live and die by “prepping” and having bowls with all my ingredients measured out and ready to go, it reduces my amount of anxiety once I start cooking, just to know that things are ready to go when I need them). After that I followed the directions step by step. Do you know what the most beautiful kitchen smell is? Loooooooking good! 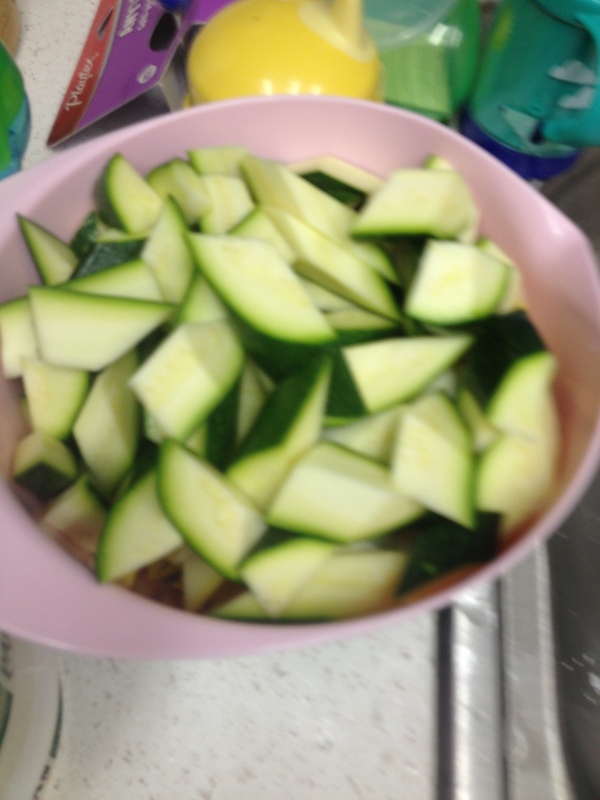 At this point my pasta was already done, and the recipe says the zucchini and pasta should end at about the same time. 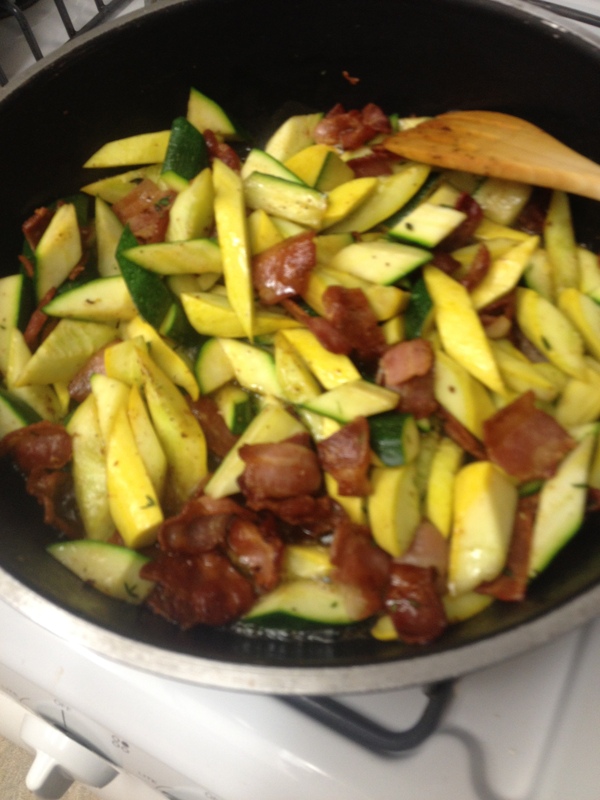 So either I was slow in getting the zucchini in the pan (which is possible), or the pasta cooked faster than expected. 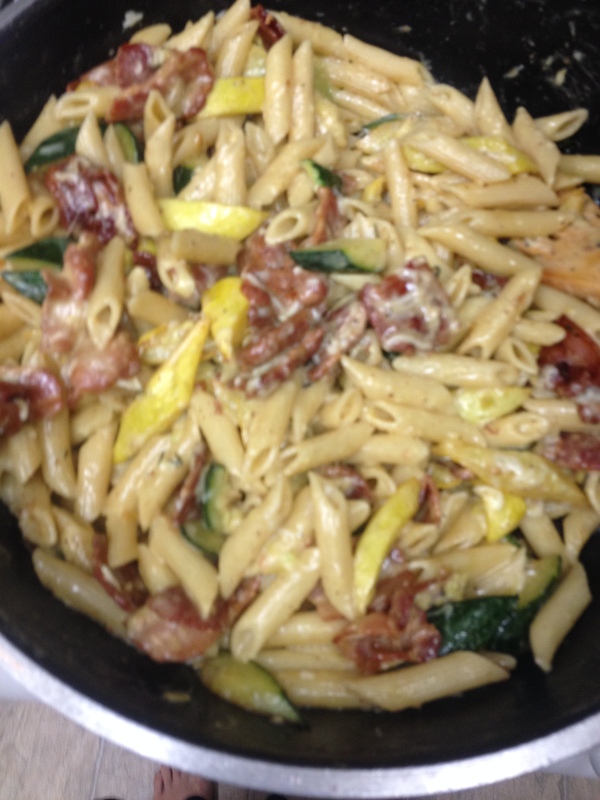 Either way, I think next time I make this I will wait to get the pasta cooking until after I cut the zucchini or once I get the bacon going. Yesterday I decided to try a couple recipes from Pinterest (rather than my usual AllFoods.com), and I was pleasantly surprised! I went with a Lime Cilantro Chicken, which turned out deeeeee-licious! I still can’t believe how happy I was with this, especially considering how easy it was. I was a little weary of the cumin and chili powder, but the lime and cilantro are the flavors that really jump out once it’s all cooked. 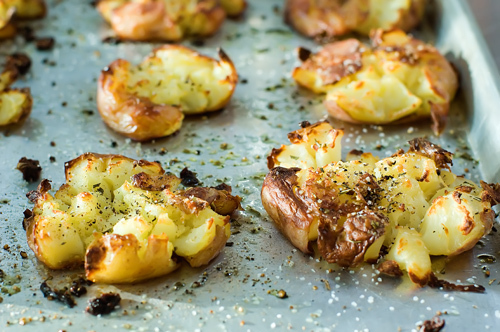 For a side dish we made Crash Hot Potatoes. Ours did not look nearly as beautiful as these (they cooked unevenly and did not squish quite this perfectly at all like this), but they were so, so good! We used a seasoning called Herbs d’Provence, or something like that, which already has a mixture of great herbs and spices. One thing to keep in mind is that these take a while. You have to boil the potatoes first (which depending on how many you’re making and how much water you’re using, could take a while), and then you back them for an additional 25 minutes or so, so plan accordingly–we didn’t and we were starving by the time we ate. Ha, maybe that’s why I thought everything was so good! I’m pretty sure this chicken would go great with rice instead of potatoes, but we’d had rice the night before so I decided to switch it up. Added a salad on the side, and ta-da, dinner is served! 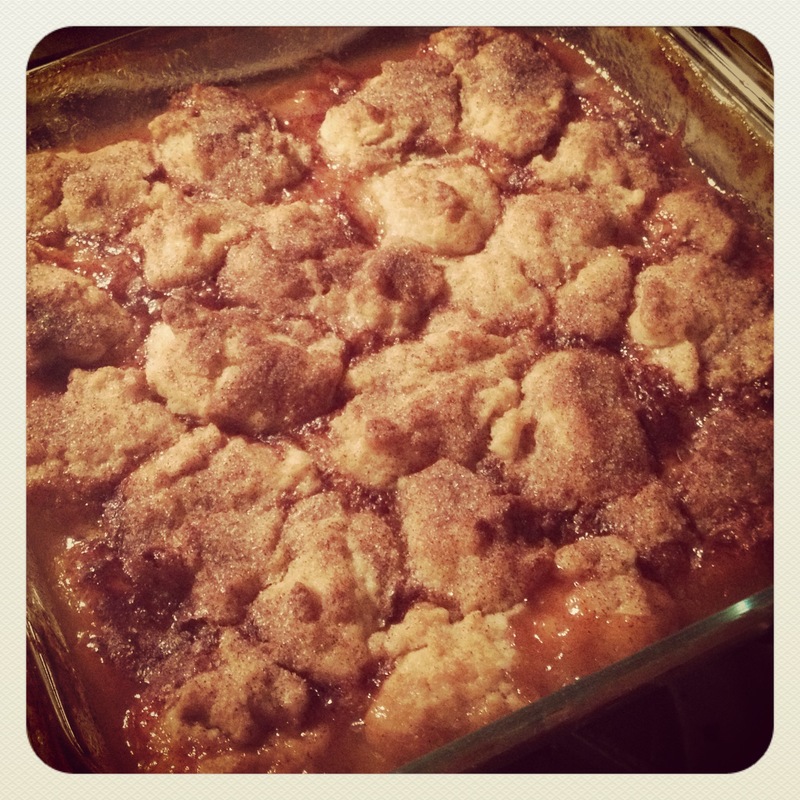 I realized recently that it’s been a while since I baked or fixed a dessert for a special occasion, so this Fourth of July I decided to make something I’ve been wanting to make for a long time now: PEACH COBBLER! 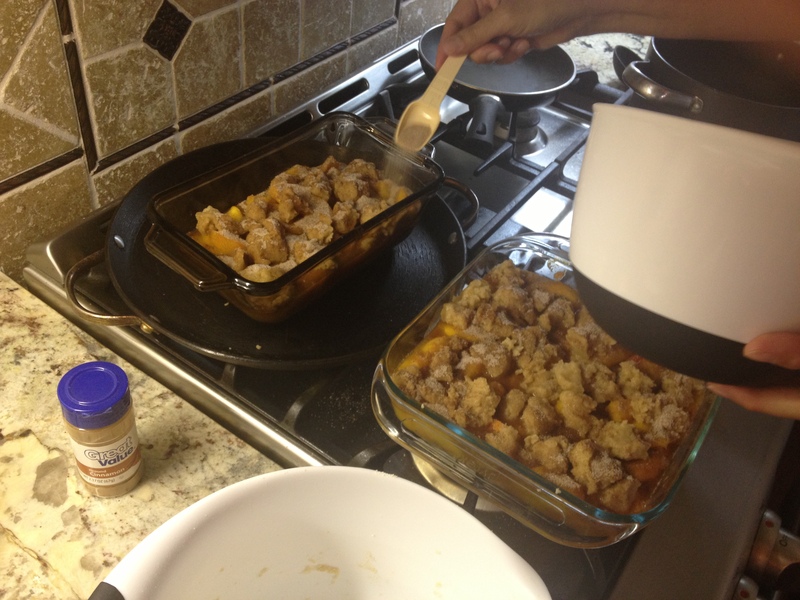 My obsession started when I fell in love with the Peach Cobbler from Lucille’s BBQ. 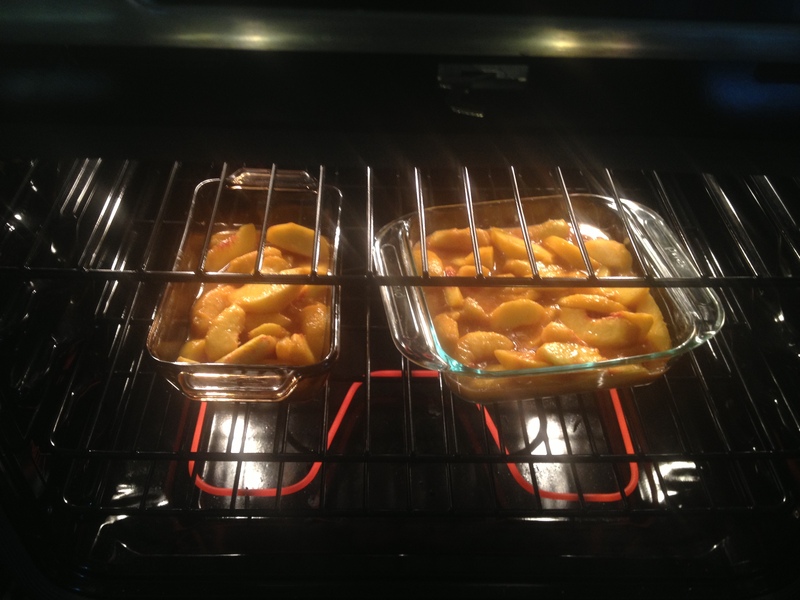 Since then I’ve wanted to make a good, made from scratch, peach cobbler. I settled on this recipe yesterday, and I’m very happy with my decision. I think the topping on the Lucille’s peach cobbler might have been a bit sweeter somehow, but that could also be my imagination just taking flight (it’s been a while since I’ve had it there). 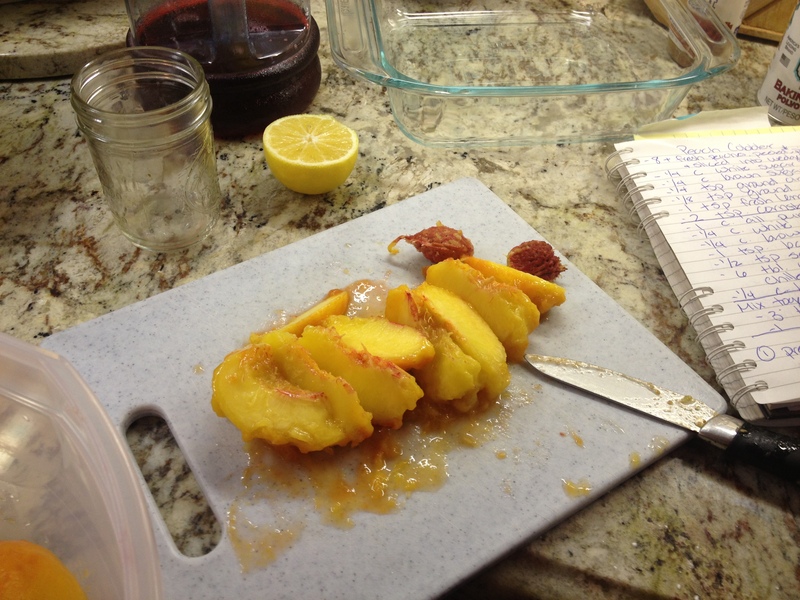 I didn’t make many changes* to the original recipe, so you can follow the link for ingredients and instructions, but I’m posting some pictures below of the process. 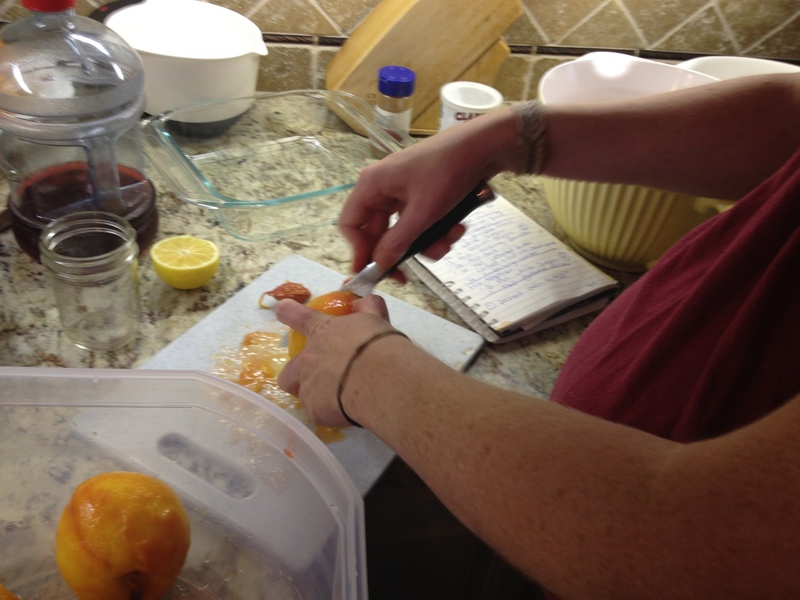 Slicing the peaches after they’ve been peeled (*instructions called for thin slices, but everyone advised to do thicker slices which is what I went with). Yep, that’s my baby belly. 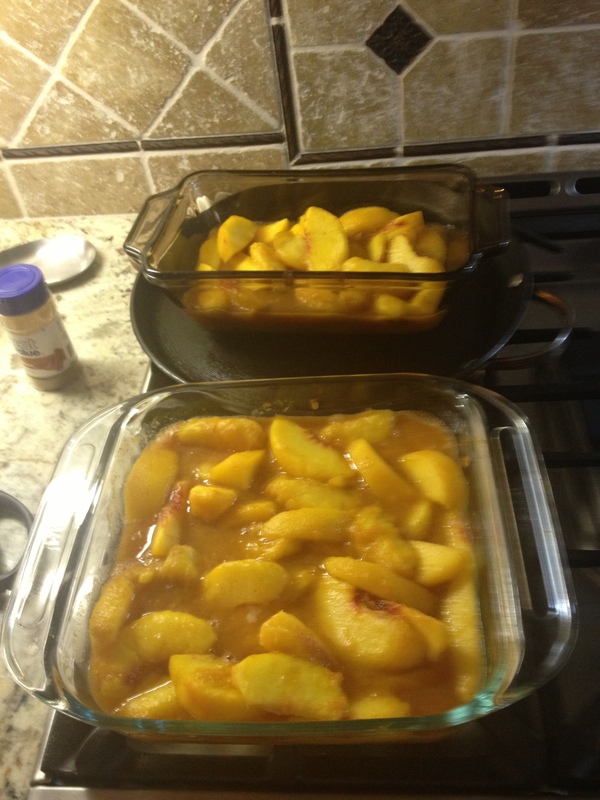 First phase of baking… (the peaches I bought were pretty large, so one 8×8 pan just didn’t seem big enough. I’m glad we put the extra in another dish, otherwise the whole thing would have overflowed once we added the breading & topping). It already looks good! This is after just ten minutes in the oven. 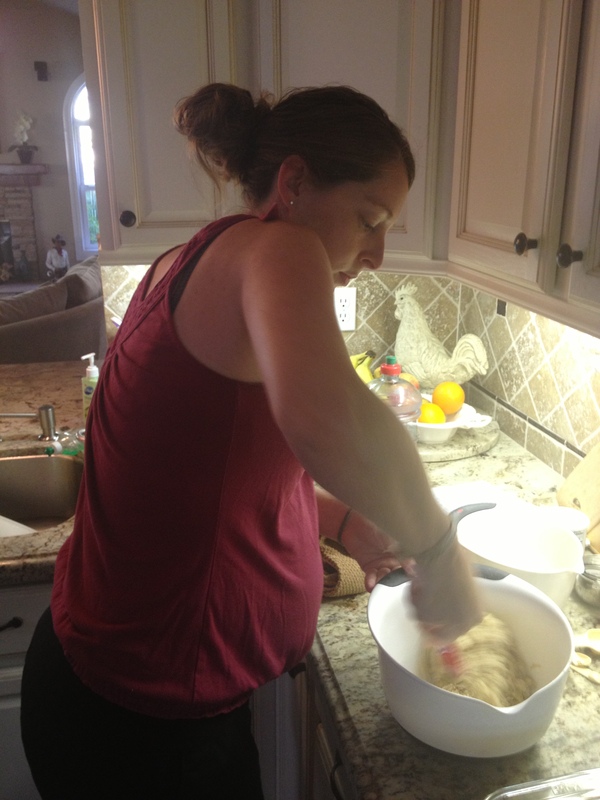 Preparing the breading and topping. I went ahead and paired this with Breyers Homemade Vanilla ice-cream. SOOO GOOD!